Summarized Explanation for the EMM Model Click here to download. Why is the Moon more like a planet? Why do the Earth and Moon share the same orbit? Why is the Earth's axis tilted? Why do Earth's plate tectonics, active volcanism and raised granitic continents, not to be found on other planets, exist? The Giant Impact (GI) and Earth's Metamorphosis (EMM) Hypotheses Compared Click here to download. NASA has failed to support the GI hypothesis with Apollo Mission and Moon space probe data. The compiled data better supports the EMM hypothesis and undeniable reasons are given. What is the True Genesis of Earth and Moon? Click here to download. A strong connection between the Biblical Genesis story and the Sumerian Epic Tale of Creation, as translated by Zecharia Sitchin, is confirmed. Technical reasons are given to corroborate this ancient epic taken from the cuneiform inscribed on clay tablets and stone scrolls found in the buried cities of a 6000-year-old Sumer civilization. Some of the technical verification is actually supplied by NASA findings. But NASA is still in denial about how their data from the exploration of the Moon addresses the Genesis of the Bible and the Sumerian epic tale. The Solar System's Story is Revealed by Its Moons Click here to download. 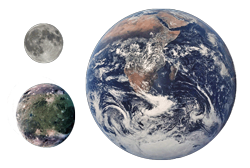 Our planet's Moon is contrasted with all the other satellites in the solar system. Detailed differences are listed which aid astrophysicists in postulating their unique origins. These origins and their surface features foretell a frightful, periodic, catastrophic past that still may keep occurring to endanger us in the future. The Connection Between Nutrition, Cancer, and Long-Term Health Click here to download. This presentation diverges radically from the typical topics of these journals because the author feels this important message cannot be ignored. The present status of the modern, Western medical system is to handle the diseases of poverty very well. However, no stated preventative steps are provided for cancer, heart disease, diabetes, or obesity - known as the diseases of affluency. The AMA mostly provides drugs and mechanical and surgical treatments for these diseases. The AMA only becomes assertive after people have acquired certain diseases, but has no expectations of reversing or stopping the disease. You pay dearly to add a few more years, mostly painful or uncomfortable, to your life. The Great Deluge: Fact or Fiction Click here to download. This presentation about a global flood, better known as Noah's flood, is proven by a huge collection of traditions and over 230 flood legends that have been handed down by written and verbal accounts since its proposed occurrence 11,500 years before present. A myriad of cultures on every continent have their own distinct but similar story that gives credence to its authenticity. Supplementary records in geology, zoology, biology and paleontology provide evidence of calamitous events surrounding this feared, presently forgotten and unspoken flood. Mankind's Chaotic and Mysterious Past Click here to download. This presentation discusses the influence and prophecy of the Sun's sister star, Nemesis. Evidence is given for a brown dwarf star that orbits our Sun about every 3600 years and creates various forms of havoc with Earth and other celestial bodies in our solar system. Both astrophysical and archaeological proof are provided. NASA's search for this destroyer star have continued since the 1980s with state-of-the-art ground and space telescopes; reasons for failure to detect this dim star are given including its predicted return.